Posted on July 31, 2018 August 1, 2018 by JanPosted in Discussion, VideoTagged Danny Gokey, Hope in Front of Me, Morning Blend. Next Next post: Have You Ordered Your Hope Encounter Tour Tickets? Nora is now in Nashville, I believe. Jan, you might like her comments about the Green Bay Packers. I found a cute article about Milwaukee and the Bronze Fonz statute… and it took me awhile to figure out why Google wanted me to read it. It featured a picture of Danny and the statue! The air quality is better today, so maybe Danny and his fellow FishFest artists — not to mention the audience! — has caught a break. It’s going to get bad again on Sunday. I don’t like to think of artists singing when air quality is bad. Not good for their lungs! (Or their voices.) Not to mention the lungs of audience members, especially little children. Not sorry I’m not there. Yes, it looked like a pretty day. Danny and the band sounded very good. I wonder in the hot and humid weather if Danny and his band would be more comfortable in dry fit shirts. It must get very draining performing in the summer heat. Black t-shirts and jeans for the band does seem HOT. And did you notice the reappearance of Mr Towel. 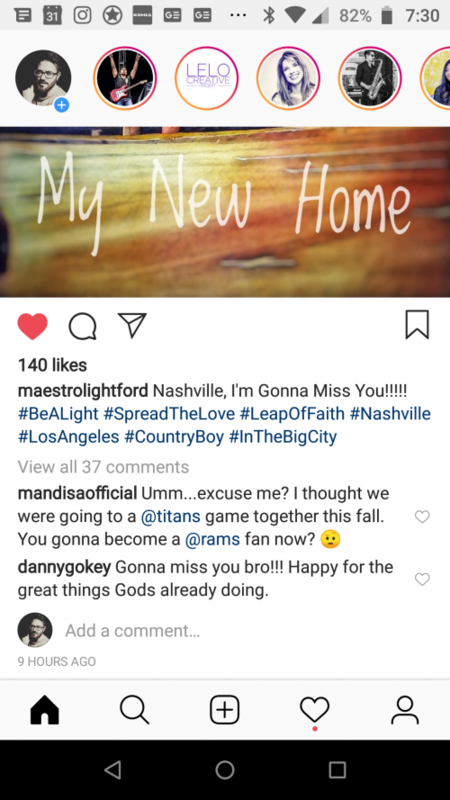 Maestro and his wife have moved to LA… According to Danny’s comment on his Instagram… He is leaving the band. He will be missed. We wish him great success. That is sad news. You never know what is going on behind the scenes. Hope good things for Danny… What does everyone think? You are a Longtime Fan indeed, if you remember Mr Towel! Heard a commercial on the radio (107.9, I think) for Danny’s Eugene, Oregon concert at the Hult Center in October. I hope it sells well. I came in at the middle of the commercial, so I don’t know if they plugged the Portland concert as well. I just heard from Danny’s management that he has a conflict and will not be on the 2019 K-LoVE Cruise. He is planning on 2020. I wonder if Maestro will complete this year’s tour or if a new music director and keyboardist is already being trained? I will miss him. Sorry to hear Maestro is leaving, he was a great presence on stage and with Danny. Hope he’s relocating for a great opportunity. Was Danny confirmed for the 2019 K-Love cruise, so this would seem like a change to take on a different commitment? Or he was never signed on to it anyway for next year. Just a question…. Do you think everything is going as well for Danny with the company representing him now, than his last?? Danny was on the KLove cruise website and listed as a show on his own website. He had a conflict and they postponed his participation until 2020. This label is very well connected. I think it will open opportunities in Danny’s genre. Too soon to see their effect, yet, IMO. Does Danny sing on the English version? I like the Spanish version just fine; doesn’t matter to me if I don’t know the words. The radio edit of TUYO (which I posted above) is now for sale on itunes. Danny’s and Jordan’s parts seem unchanged. The parts for the SCM are all English and shorter. Wow. I wonder why Danny was cut from his 9th grade singing group? I was trying to find the original interview that talked about his not making his HS elite choir, but I couldn’t easily. So I just have to use my memory to reply. I think Danny said he tried out for their elite choir (show choir?) and didn’t make the cut when he was a freshman. His older brother was in the choir… he was so discouraged that he didn’t try out again and stuck with his trumpet. It wasn’t until he started going to Faith Builders and joined their choir that he started building his confidence in his singing ability. They were giving him solos and then his pastor asked him to lead the choir/be the praise and worship leader. This was a big move for Danny. And even after that, he was more use to having his back to the audience and keeping his eyes closed when he sang. He definitely had a learning curve (via Idol and his early career) on connecting with the audience. I think it was pretty common for awkward, still growing into their voices, 9th grade boys not being accepted in all school elite singing groups– he should have tried out again as a 10th grader. But we know he is very competitive and not making the group was probably really embarrassing for him. I already own the Spanglish version of Tuyo, so I didn’t add this version. Glad Danny’s section wasn’t changed. I think he kills it on this song. Jordin is very good, too. I have a lot of respect for the sacrifice, committment and courage John McCain showed through his life. Cancer is a cruel disease. You are welcome, Angelsnell, I’ve got plenty of other Danny tidbits clogging up my brain…. Went to the American Idol concert tonight. Did the M&Gs with Kris and the other one with this season’s Idols. Met Krismicklin, a big Kris fan, who was on Danny’s cruise some years ago. More later. I need to crash. Jury duty tomorrow. I follow Krismicklin and remember her from the SHF Cruise. She is also a fan of Danny (on a much smaller scale). I think she has gone to 4 or 5 of this year’s Idol tour. Looking forward to your thoughts/review of the Idol tour! Its been leaked that Danny & Natalie have recorded “The Prayer” for their tour!! I remember Danny saying he had recorded the lead single for his new album. And yesterday we learned that he and Natalie recorded “The Prayer”. Could it be that it will be the same song? Or do we get two new recordings??? My bet would be on a new song as the “lead single” for the new album, to come out in early 2019 after the Christmas season. But The Prayer as a Christmas single to keep an active radio presence and tied to the Christmas Tour would make sense. I have never really thought of the prayer as a Christmas song, but I guess since it is intended to be put out for the tour, and released during the holiday season, it becomes one? I also think it would make sense for Danny to include it on his new album. I don’t want “The Prayer” on the new album, although it would be okay as a bonus song. Maybe it’s for release during Christmas radio season but to continue into 2019 if it’s not peaked by then? Perhaps we can take this as a sign Danny has a bigger budget for this album with his new label if he was able to get the logistics/rights in place to record The Prayer for this release, when it wasn’t feasible previously. They indicated in the Instastory video that Bernie was able to get the permission to record the song. But I do take that as a very good sign. PS. I’d love a 2nd Christmas album….. not expecting it for awhile, though….